Last Saturday we drove past the Church where we were married 49 years ago today. Good memories. Talked about where the grandparents had lived and how the kids could play down the street with friends or hike to the parks from their homes and play outside until dark, a different freedom then. We have been reminiscing quite a bit these days, looking back with a much clearer understanding of those who have gone before and how hard they worked to raise their families and make sure they would have enough for their retirement years. All Saints Day. My Dad and the Family and DH's Family and our Friends gathered together to celebrate our marriage - my Dad officiated. We walked together to Marnie and Popsie's (DH's Grandparents) home just down the block from the Church. My Mom had brought the wedding luncheon and decorations and cake and set everything up for our Reception. I look back in awe of what she was able to accomplish after driving 7 hours from their home, to set everything up before our Wedding. We were such sweethearts when we were 22. Purple was a big deal in 1969.
and flashed by so quickly. Hugs to you my Friends. Oh, Joy!! Happy HAPPY Anniversary! 49 years! That’s amazing! I’m so happy for you! Happy anniversary, Joy. It's nice to be reminded of that celebration. I had forgotten that Mom did all the food, just as she did for our wedding 6 years later. Happiest of anniversaries to you. We've learned to cherish what time we have this year as you never know how much you have left. You two look so sweet and in love in that photo. It's nice to know marriages can last! My mother in law died in June, but she and my father in law celebrated their 71st year of a happy marriage before she left us. That’s a great blessing. 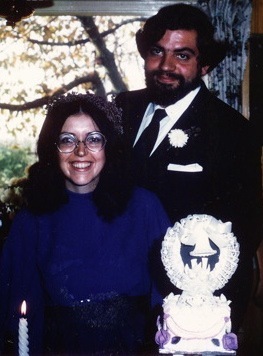 We have our 47 Th Wedding Anniversary very soon. It’s Nov 5th.